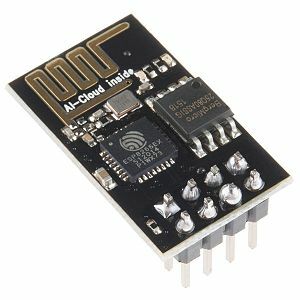 ESP8266 is a low-cost Wi-Fi chip that allow to bring the power of WiFi in any DIY project. There are a lot of modules starting from 2$ that bring this chip very easy-to-use, the most common is the module ESP-01. 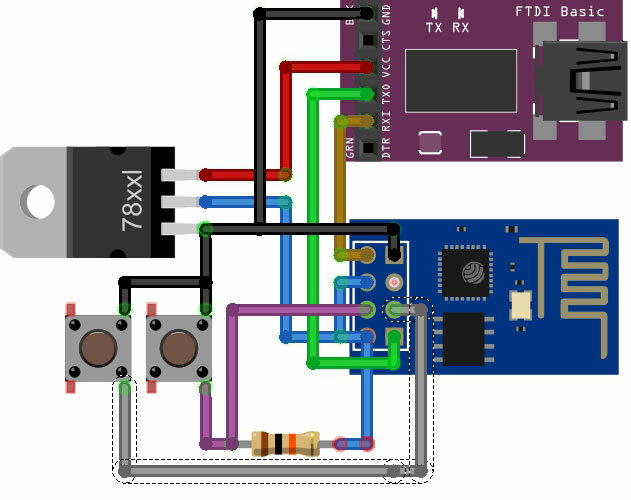 Starting from v2.7.0 LaserGRBL support WiFi connection with ESP8266 allowing each hobbyist to get rid of the usb cables between the pc and his engraver. As second step you need to load a special software on your ESP module. To do this you need a USB-serial converter (like those used to program arduino). All the necessary sketch and library can be downloaded from github page. This software implement a WebSocket to Serial bridge. 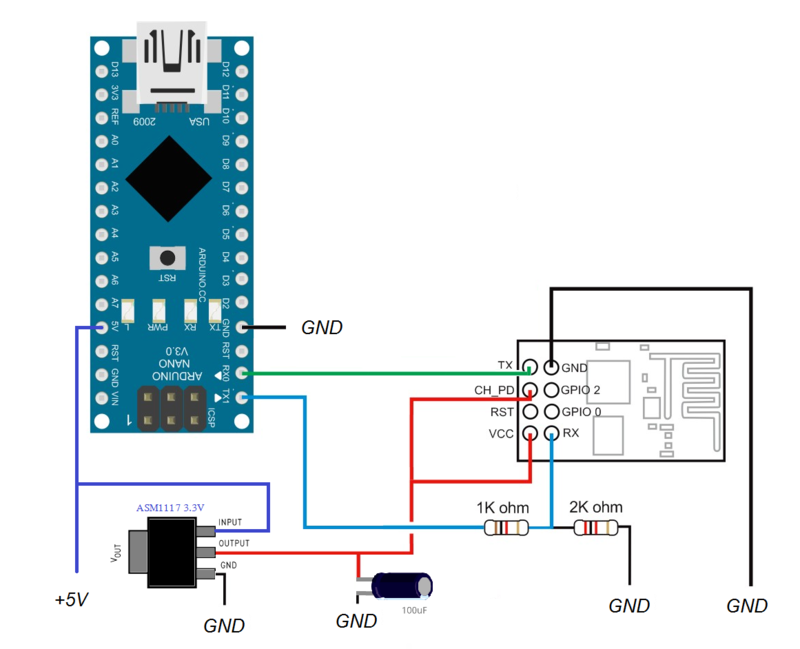 Third you must connect your arduino serial port to ESP serial port. Finally you can use LaserGRBL to connect via WiFi. Have Fun!!! Flashing a program to the ESP8266 is a bit more annoying than flashing an Arduino. When flashing the arduino, all you have to do is press the reset button and release while you upload a program (or even not doing anything if you have FTDI such as in arduino UNO,MEGA) and the arduino will start uploading. Which will make your life easier. NOTE: The «78xxl» part is actually LM1117 part, or any 5v to 3.3v converter. Working on normal mode — Both buttons are released. Resetting the ESP8266 — Press the reset button and release. Start in flash mode — Press both buttons, release the reset button and then release the GPIO0 button. Once you have built this circuit and downloaded all the required library and sketch you can flash websocketserver.ino to ESP8266. (press reset and GPIO button and then release reset and GPIO to put ESP in flash mode). If you have flashed your ESP correctly you must now find a new visible WiFi in your PC with ESP8266 name. You will find a page where you can configure the ESP8266 module to connect to your existing WiFi using your WiFi password. Once ESP is connected to your network the ESP8266 network will disappear. You now must find the new ESP8266 module IP address in your router WiFi connected client list. This schema show the correct way to connect ESP8266 module to arduino. If you use Arduino UNO you must use RX and TX pin as same of Arduino Nano in figure. RX to TX, TX to RX. WebSocket conenction must be enabled in settings. Once enabled you can configure the websocket URL to connect to your grbl. It is also possible to use a Telnet protocol instead of WebSocket. The procedure is the same but you must use this sketch to program your ESP8266.